Originally self-published by Mike Edwards in 1983, Zombies was a relatively huge hit. Don Daglow of Electronic Arts took interest in Edwards' game, and acquired the rights for EA to publish the game as "Mike Edwards' Realm of Impossibility", making the game a hit once again. 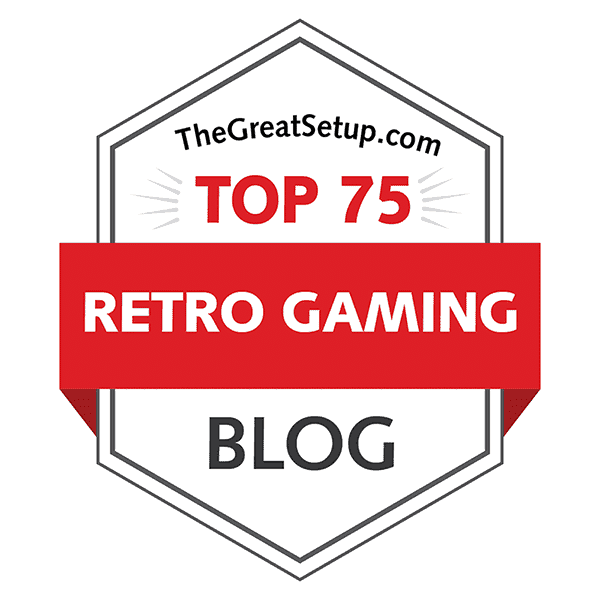 At the moment of writing this entry, the original Zombies game has a rating of 7.4 from 21 votes at Atarimania, while the enhanced re-release has a rating of 7.6 from 41 votes. The C64 conversion has a score of 8.3 from 54 votes at Lemon64, and the Spectrum version has a meagre 4.17 from 20 votes at World of Spectrum. The Apple ][ version has no reliable scores to be found anywhere, which makes the comparison all the more interesting, so let's see what we can find out. According to the original info text at the back of Zombies' cover, the object of the original game is to retrieve seven crowns from evil Wistrik's seven dungeons occupied by all sorts of dangerous monsters, primarily zombies. For Realm of Impossibility, the seven crowns have been hidden into an expanded area of thirteen dungeons, and there are some new and different items to collect on the way, but the basic idea is much the same. The game is shown in an isometric 3-D view of sorts, but with closer resemblance to games like Crystal Castles and Congo Bongo than, say, The Last Ninja or Knight Lore. Not that Realm of Impossibility actually has much similarity to any of them. To anyone who's interested, the new game title was chosen due to the fact that many of the game's mazes represent similar optical illusions that Maurits Cornelis Escher became famous for drawing - some surfaces appear to be vertical, while actually being horizontal, and other illusions of the kind. It's a rare case of an early action/adventure game, which actually evolves quite a lot towards the end. Each dungeon requires you to get as deep into it as possible, until you find what you are looking for, then pick the item up and get back up the same way you came in. In addition to all the monsters, you can find magic scrolls the dungeons, which feature spells you can cast to make your adventuring easier for a while, but you cannot kill anything. Your man also carries a bunch of magic crosses, which can be dropped to protect you for a small amount of time, but you can also get trapped in them yourself. The game also has a brilliant co-operative two-player mode, which requires some proper co-operation in order to succeed in your endeavours - this is one of the earliest examples of such attention put into a two-player mode. 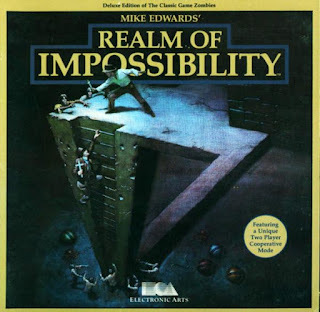 In my opinion, Realm of Impossibility is one of the most interesting early games from Electronic Arts, which is saying a lot, since this was a company that actually used to release quite a lot of high quality games in the early 1980's. If there are any representatives of the younger gaming generations out there reading this, do yourselves a favour and try this out - preferably with a friend. And then go and immerse yourselves in games like Archon, MULE, Murder on the Zinderneuf, Seven Cities of Gold and Mail Order Monsters. As for the rest of you... well, you know what I'm talking of. Loading screens, left to right: ZX Spectrum (Ariolasoft), Commodore 64 tape (Ariolasoft), Commodore 64 disk (EA). But even less interesting are the loading screens, which are very much connected to each version's publisher. Electronic Arts had their own original EOA logo shown for the disk loaders, while Ariolasoft had their own, rather similar sort of screens. Not much to tell about, as you can see them all above. Moving on, then. Happily, this is one of those occasions where I have no actual need to write any instructions, because the game offers you all the information you need to know on how to play the game. At least every other version does but the SPECTRUM one, so I will do everyone a favour and just throw in a bunch of screenshots from all the versions of the game that have some instructions and get on with the actual comparison after that. I guess this somehow violates the rule of showing any of the screenshots before the Graphics section, but nevermind - I'll talk about that aspect when it's time to do so. 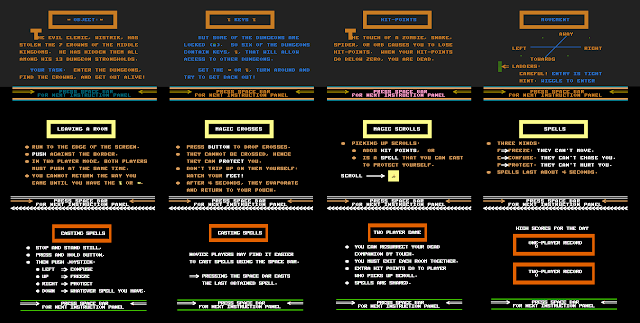 Instructions screens in order, as they appear on Atari (top 1/3), C64 (middle 1/3) and Apple ][ (bottom 1/3). What the in-game instructions don't tell you is that all the monsters take an interest in the player closest to them, which is a useful gameplay element in the two-player mode. Also, the instructions concerning entering the ladders isn't entirely correct: you can enter the ladders quite easily, as they have more room for error than it appears. You can't fall off from them, and there is enough room for you to wiggle your way up and down faster than just by pushing the joystick up or down. The illusion bits, which aren't as numerous as you would expect, aren't explained much at all, so I might as well give you an example here: in Ethereal Plane, you get into a few illusion areas, one of which takes three screens' worth of space, and consists mostly of horizontal platforms and some connecting bits. The central screen has a ladder at the bottom, which you can climb to get to a higher platform, which looks to end in a dead-end, but it's a passage that goes through all the way up. If you hadn't realized that before, I hope this helps you to get forwards. For some reason, the ATARI version of Realm of Impossibility doesn't work properly on any of the emulators I've tried; all the enemies seem to have vanished, as if this was an unconquered copy protection scheme or something. Happily, the original game, Zombies is basically the same game with slightly different graphics and less dungeons, so I'll base my comparison into my experience with that game. Two of the earliest versions of Realm - these being the ATARI and C64 versions, play very much the same, as far as I can tell. Only the loading times are just slightly different, which doesn't really matter in the end. In fact, there aren't that many differences in any of the versions regarding the actual gameplay - most of the differences that matter have to do with graphics. That said, the quality of the graphics actually affects the gameplay as much as anything else will in this occasion, which I think is rare. The SPECTRUM version suffers from graphic problems the most, which is strange, considering that the machine had some earlier isometric 3D games that worked fine, such as Ant Attack and Knight Lore. Then again, the graphics engine for Realm of Impossibility is very different, and all the sprites are animated differently, which causes a great deal of flickering on the Spectrum, as well as increasingly bad slowdown depending on how many other characters are there on screen besides your own. Also, the screen size being a bit smaller made it necessary to rearrange some of the rooms, which makes you think your way through the enemy lines differently, if that can be considered an inconvenience, but some of the readjustments have created deadends and strange passages that allow monsters to move to a platform on a different altitude just because it's diagonally close enough. All this paired with relatively long loading times compared to any other version might give you an impression on why the Spectrum has been given such a low score at WoS. Oh and also, the game can only be played on a 48k Spectrum - the 128k machines will not load after the first dungeon. There weren't too many problems in the APPLE ][ version, and the ones that I could make note of are relatively inconsequential. For one, you share the same colour with the zombies (white), which can cause some occasional disorientation, but your sprite looks different enough for you to distinguish it easily enough from the midst of a bunch of zombies. Another one that could be considered an inconvenience is the speed at which the screen scrolls when you come to a different room. Finally, the zombies are as fast as you are on the easy level, while on the C64 and ATARI versions, they are slightly slower. This affects the balance of gameplay a bit. So, what have we found out? Not too much. The ATARI and C64 versions are as similar as you could possibly hope for them to be, and since they have the most fluency in animations, scrolling and handling of action, this makes both versions equally superior to the other two. The APPLE version isn't too bad, but does suffer from a bit of slowness as well as a slightly different overall balance in gameplay. The SPECTRUM version is clearly the most unfortunate one here, which is a pity, since it could have been a lot better with a different approach to the graphics. There is just one matter I would still like to adress here: in Zombies, your hit-points are taken away more easily by enemies, and you will only get 20 hit-points for bonus after completing a dungeon instead of 30, as it does in the other game. In essence, Realm of Impossibility is the more user-friendly game of the two, and as such, is the preferred starting point for beginners. Since the game looks basically the same all the way through, with changes to colour scheme according to each dungeon, I thought it might be enough to just include a few screenshots from the first three dungeons. But naturally, we need to start with the title screens. Title screens. Top row, left to right: Atari 8-bit (Zombies and Realm), Commodore 64. Bottom row, left to right: ZX Spectrum (controls and title screen), Apple ][. All the title screens have some sort of animation in them. When the game boots up, the first thing you will see is the info bar at the bottom of the screen, although the actual title screen also drops down from the top instantly as the game has loaded. The APPLE version scrolls the title screen in from the right, but that's not much of a difference compared to the SPECTRUM version, which starts off with a screen for control options, and only then goes into the title screen, which looks very much different to all the other versions. In all versions, however, the basic animated content is the same: some monsters are moving around on the platform(s) shown on beside the title. In the two ATARI versions, the title logo itself is a bit more interesting to look at, since it changes colours between dark pink and turqoise in a familiarly Atariesque manner by going through lots of colours within a very small amount of time. Show-off. Dungeon menus. Top left: Zombies (Atari). Top right: Realm of Impossibility (Atari). Bottom row, left to right: Apple ][, ZX Spectrum, Commodore 64. When you decide to start the game, you first enter the dungeon menu, which shows you which dungeons are freely playable, and which ones require a key. Plainly, you cannot complete this game in a completely free order, but that shouldn't be much of a problem, since the later dungeons are quite a bit harder, and might require lots of hit points, which have to be collected by playing the other levels. In Zombies, all seven dungeons are freely accessible from the beginning. After you have collected a quest item from any of the dungeons, the item appears in the dungeon menu before the dungeon's name. I might as well take this opportunity to talk about the instructions screens, where available. The fact that they're missing altogether from the SPECTRUM version drops some points instantly, but I'm afraid that's the least of its problems. Anyway, the instructions screens are shown in nicely unintrusive colours, but with a different colour for highlights in places where deemed necessary. The APPLE version doesn't have any highlights, but at least it's all there. Naturally, the ATARI version has the "Press Space bar for next instruction panel" bit changing colours, similiarly to the title logos, while the other versions just remain strictly informative. Well, I think that's enough about the text bits for now - let's move on into the action. Screenshots from dungeon #1 "Cankaya Keep". Top row: Atari 8-bit (Zombies). Bottom row: Commodore 64. You saw from the earlier screenshots that the ATARI version of Realm of Impossibility has a differently coloured info panel at the bottom of the screen to that of the original game, Zombies. Unfortunately, since I couldn't find a working combination of any version of Realm and any of my three optional emulators in use to get the monsters to show up, I had to take the in-game screenshots from Zombies. Therefore, the graphics comparison will be limited to dungeons featured in both games. What we can see quite clearly from comparison shots of the first dungeon (Cankaya Keep) already are two things: both the ATARI and C64 versions have very similar base graphics, and that the ATARI version utilises its much wider colour palette to its advantage. Mind you, the C64 would have had more colours to put into good use here, but for some reason, Edwards and Bolley decided to go with only four colours for the background elements, so it's really a bad graphics design decision to include bits of background to be of the same colour as your own sprite is. The fact that all the sprites are only single-coloured stick-figures or other simple-to-draw objects and each have their own colours, would have easily (I guess) allowed for some additional colours to be used. But otherwise, both versions' colour schemes have their own advantages. While the ATARI's play with shades is softer to look at, the C64 version is clearer at places, precisely due to the more extreme use of colours. More screenshots from dungeon #1 "Cankaya Keep". Top row: Apple ][. Bottom row: ZX Spectrum. The APPLE version doesn't differ too much from the above twosome in still shots, although you can clearly see what the lack of colour does to give this version a disadvantage. In action, though, there are a couple of things that make it clearly apart from the earlier set. First, there is some notable slowdown happening when there's more action on screen. The second thing is, proceeding from one room to another happens slower, and the screen doesn't scroll properly, but instead takes a few big steps to move the screen forwards. But wait, there's more to come. The SPECTRUM version differs quite a lot in many ways. Due to the game's simplified stick-figure graphics, there isn't much that a bit of hi-res adjustment can do, because simple graphics will look like simple graphics on any machine. If anything, Spectrum's well-known attribute clash problem makes the diagonal bits look awful, and causes more than just graphical problems later on in the game. Here, it just makes the white zombies occasionally black or cyan. There is also a great deal of flickering going on, which made taking some screenshots a nightmare. Along with some of the level layouts, some of the environmental details have been altered quite a bit for whatever reason. The new layouts can be explained by the different screen size, but I find the missing details very curious. Screenshots from dungeon #2 "Tartarus". Top row: Atari 8-bit (Zombies). Bottom row: Commodore 64. Although the colouring differences are less interesting in the second dungeon (Tartarus), there are some minor, but notable readjustments in room layouts. This has more to do with the C64 game being a new version, and the ATARI screenshots having been taken from Zombies, since the same layout readjustments are in the ATARI version of Realm as well. So, not much of difference there, but the little that can be said is more of the same as before: the Atari version has a slightly better overall colouring and a bit more little tricks. More screenshots from dungeon #2 "Tartarus". Top row: Apple ][. Bottom row: ZX Spectrum. Again, the APPLE version looks as garish with its choice of colours as the SPECTRUM version looks different to all the others. This is where the SPECTRUM version's problems with colour limitations and room layout differences really start to matter. If you take a look at the last screen in this set, you can see that not only have some drastic changes been made to the integrity of the pyramid-like structure, forcing the player to use a single route both ways, but also the two wall blocks high step between the topmost platform and the second-highest one are linked to each other through the cyan/black-coloured bits. Through these gaps, the monsters can easily jump up and down. Screenshots from dungeons #3 "The Abyss" & #4 "Ergazi Sheol". Top row: Atari 8-bit (Zombies). Bottom row: Commodore 64. Since there is such a small amount of graphical elements in the game that can have any difference, I decided to put two dungeons (The Abyss + Ergazi Sheol) into one comparison set, and leave off with that. For C64, the first of these two is pretty much the equivalent of the first dungeon in the Spectrum version, since it often utilises a yellow background behind white zombies, which is a bad mixture. The ATARI version doesn't seem to have any occasion during the whole game, where you would have trouble seeing everything on the screen due to the awkward colour choices, which pretty much makes it the winner here. Sometimes, though, the colour schemes on the C64 make a better atmosphere, as it appears in the latter two screenshots from Ergazi Sheol. Still, I suppose the colour scheme is a matter of taste as much as it is a matter of limitations. More screenshots from dungeons #3 "The Abyss" & #4 "Ergazi Sheol". Top row: Apple ][. Bottom row: ZX Spectrum. Compared to the earlier twosome, these two versions represent the opposites in representation. The APPLE version has less choices for colour, and even sometimes less colours in use, as it appears in Ergazi Sheol. The other two shots from the Apple version bring an altogether too familiar set of colours used by countless other early Apple games, but at least it's never unclear, like the earlier dungeon. The SPECTRUM version, on the other hand, is starting to show an almost dangerous amount of colours per screen, which would otherwise be interesting, but the flickering is constant, as is the attribute clash. Seriously, based on these screenshots of the Spectrum version alone, I would guess this being a fairly interesting little game, which it is, but the sad truth is, the presentation is lacking in such a bad way, that it affects the playability enough to declare it little more than a mess. Enter your name for high score table. Left to right: Atari 8-bit, Commodore 64, ZX Spectrum, Apple ][. In case there's someone out there still willing to play the game on any of the available platforms - which I certainly hope you do - I will leave the rest of the game for you to find out. There are only a handful of areas in the game, that actually show you some nice illusion-based room layouts, and they are all locked in the beginning. But for now, I will end this lot with an obligatory "Enter your name" screen, which will be shown if you get a score good enough for the high score table. As you saw earlier, the high score table itself only keeps the highest score of the day in memory, but features an entry for both one-player and two-player modes. As for this particular screen - I don't think there is much worth noting aside from the SPECTRUM version, which has a rectangle around the score and writing spot, which uses the basic flash command to swap the graphic priority, which makes it look like the rectangle enlarges and shrinks in turns. The cursor for writing your name also flashes similarly. In short, the ATARI and C64 versions feature similar graphics, with a slight colour-related advantage on Atari's side; the APPLE version has bad colours and bad scrolling, but is otherwise an acceptable port of the original; and the SPECTRUM version has bad flickering, bad cases of slowdown, often redone layouts and sometimes radically different, if a bit funky, colour schemes. I think we're pretty clear on this one. I shall have to start by comparing the two ATARI games, because Zombies and Realm of Impossibility both have different title tunes. In Zombies, the title tune is a pseudo-arabian bundle of mess that has two sections that loop for a while after another. Both loops only have a very short and fast 4/4 melody with two notes on top of each other at most. It might become very irritating quickly, if you're not a fan of melodic obscurities - and even then, it will become boring after a short while. In Realm, the title tune is a more proper tune with plenty of different sections, an insanely catchy melody reminiscent of Indiana Jones, Montezuma's Revenge and all those other similarly styled cultural phenomena, and has three voices playing simultaneously for most of the time. I think there is even a short melodic quote from some cartoon or whatever, but I can't really place its origins anywhere... it's definitely familiar from elsewhere, though. If anyone can name the second bit in the second section (just about 25 seconds from the beginning of the melody on a PAL system, if you care to check), throw a comment at the bottom of the page, thank you very much. Realm also has an additional, shorter tune that is played at the beginning of a new game when you are shown the dungeon menu for the first time, and at the end of every dungeon. This shorter tune is basically a derivant of the title tune, but is only two bars long and has an ending of sorts, which the title tune does not. The sound effects are the same for both versions: tapping noise for walking, short melodic effect for leaving crosses, crumbling sounds for crashing into enemies, two different melodic sound effects for picking up objects (quest items, scrolls and extra hit-points), a rapid repeating of pip-sounds when you enter the magic menu, and three short loops of two-note or three-note melodies for each magic effect. The C64 version of the title tune doesn't repeat any section, only goes through every section once and returns to loop the song from the top. It also uses more sustained horn-like instruments for the tune, almost like trumpets and English horns and such. All the sound effects and the short extra tune are there, but some of them sound a bit different. Since it's all very early days and defy any realism in sound, I can't really comment on the quality of the C64 sounds compared to the ATARI ones - they're all same enough to me. Just a matter of opinion, which sounds you have grown to love more. I encountered no music whatsoever in the SPECTRUM version, and the sound effects were scarce as well. There were four sound effects in total that I could find: three differently pitched "tick" sounds for leaving a cross, going into the magic menu and taking damage from an enemy, and a long sliding sound for completing a dungeon. Not very interesting, but goes well together with its reputation. Finally, we get to the APPLE version, which surprises us by sounding quite a lot better than the Spectrum version. It features both tunes from the other two good versions, albeit in a funnily frantic single-channeled blippy style, which makes them sound quicker than they actually are. There aren't as many sound effects as on either the ATARI or C64, but there are more of them, and all of them are closer to the original than what can be heard in the SPECTRUM version. I guess this makes this section easy to close up again. It's rare that a comparison on this blog gets results so uniformed that a mathematical procedure is rendered useless. However, we shall have to go through it regardless of it, in case anything was left unclear. So, there you go. More truthful results based on mathematics you will have a hard time finding on this blog. There is still one rather unfortunate point to be made about this game, that might be considered something of a huge letdown: the game has no ending. It just loops back to the beginning once you have finished with all the dungeons, although the good thing is that you can play them all in a free order once you have finished them once. Effectively, once you have finished the game once, it offers no replay value, at least in a single-player mode. If you're lucky enough to have or find a friend who might want to have a go at this game with you, there still might be some value to this game. Another unfortunate bit of news for the SPECTRUM gamers is that while the ending is similarly non-existant for their machine, it does not even allow to replay the levels after having once beaten them all. Realm of Impossibility was advertised to have been also released for the Amstrad CPC, but any traces of a CPC version having existed have vanished. According to our favourite CPC websites, it seems as if the game was never released after all, although the adverts at the time suggest otherwise. My guess is, with the disaster that the Spectrum version must have been, EA decided to pull off the CPC version, which might have well been similar (or worse?!) to the Spectrum one. Still, it would have been interesting to see. Even more interesting would be to see a proper modern remake of the game, but no such luck yet, so we shall have to do with the originals. Thanks for reading once again, hope that was a fair enough entry for ending this month. Next month, some more surprises await. While you're waiting for all that, why not drop a comment. Oh, an early EA game, that's nice. M.U.L.E - by Ozark Softscape (Dan [later Danielle] Bunten, Bill Bunten, Jim Rushing, and Alan Watson with music by Roy Glover), originally published in 1983. Quite unique strategy game, being one the earliest games to support four players (on the Atari version). Originally released for the Atari 8-bit computers and the Commodore 64 in 1983. Ported to the IBM PCjr by K-Byte Software in 1985 (this version was considered lost until 2012, when a disk was found by someone called Vince Bray.). Ported to the PC-88, Sharp X1, and MSX2 by Bullet Proof Software in 1987. Ported to the NES in 1990 by Mindscape. Seven Cities Of Gold - also by Ozark Softscape. A type of exploration game in which you play as a conquistador. Originally released for the Atari 8-bit, Commodore 64, and Apple ][ in 1984. Ported to the Amiga, Atari ST, and as a PC booter by Ozark Softscape in 1985. Remade for PCs running DOS by EA in 1993. P.S. Most of EA's games for the 8-bit computers on disk have the same loading screen with the shapes spelling EOA. Well, I'm finding less and less time these days for doing the blog, so if anyone's interested in doing some comparisons, they're perfectly welcome to do so. I'm not sure how would this contribution thing actually work, since I haven't really thought about it that much, but I'd welcome the help. Of course, it wouldn't be entirely Finnish anymore... well, it's just an idea. Well, how is a blog post made? I've started a chat with you at G+ Hangout.